Session 38 – I Spotted Mountain Goats!!! 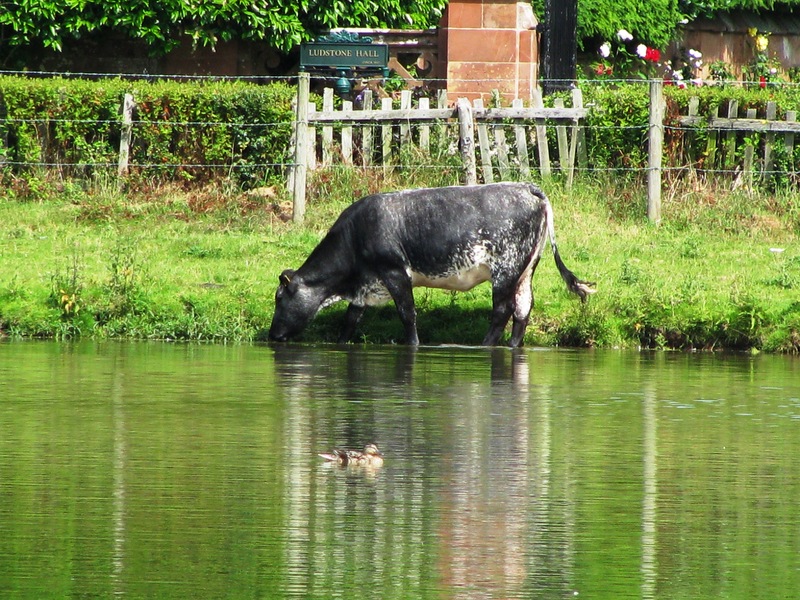 Friday 26th July 2013 at 0500 and I was walking along the banks of Staffs-Worcs canal near Wombourne – a BAA administered stretch, which was a change from the WDAA stretches I’ve been fishing so far this year. I don’t think I’ve ever fished this stretch either before in my life although I have walked it many years ago and remember watching a grass snake swimming down the middle at that time. 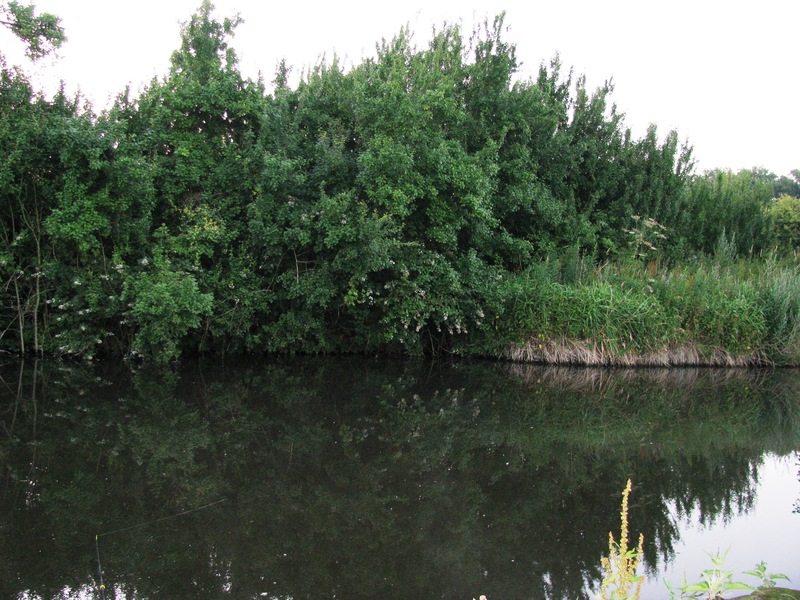 Anyway, having eventually arrived, I chose a swim that, on the far bank, had a couple of pieces of overhanging vegetation with a bit of clearer bank (12′-15′) between forming a bit of a ‘bay’ which allowed a bit of leeway in where to locate the bait – either in the bay or on to either of the vegetation overhangs. Starting bait was a small (3/8″, 7mm) cube of luncheon meat which was dipped into a tub of ‘Predator Plus’ dip as I was wishful of catching perch or chub today. And first cast, over to the right hand piece of overhang, and after a 10-15 minute wait, I was rewarded with a sudden swing of the quivertip and a 1lb 15oz chub was soon landed. A few bits of loosefeed were then added to the swim and the re-baited hook cast to the left hand overhang. After a period when the swim had been searched out without result (ie after 15-20 min intervals the bait was placed in the bay and the right hand overhang), the bait was changed to prawn – again dipped in ‘Predator Plus’… and after this bait had been in the water for 30 mins or so, and small nibble activity noted during that time, the quiver again swang round and I struck but met no resistance and supposed I’d missed but on going to re-bait I found the hook missing … no curly end so not a slipped knot… and a clean break could be seen I reckon and inch or two above the hook. Strange, esp as I was using 6lb line that I felt absolutely nothing at all and I had landed the previous chub ok and could see no obvious damage when re-baiting then. Oh well, live goes on! 😀 So for an hour or so I stayed on the prawn/dip combination, getting the small tremors/nibbles and the occasional bigger tweak – and each time the line was wound in the bait was perfectly intact. Anyway, time passed and for the last hour I decided to change to maggot on a size 16 hook, which I did placing 4 or 5 maggots on the hook and dipping in the PP dip. Within 2 minutes of the first cast, the tip swang over and a nice but small (10-12oz) bream was landed. And for the rest of the hour, bites came on every cast but none that were connected with. And at 0930, I packed up and left for home. *** By the way, AVOID Asda Smart Price Prawns! In the one bag I opened this morning it consisted mainly of ‘slush’ and only 2 prawns that were recognisable as such, although some of the larger ‘bits’ were hookable on a size 12 – just about! I’ve another unopened bag so, when I open that, it seems this first bag is NOT representative of what was in the second bag I’ll report it in a later posting… Morrison’s ‘Value’ bags are far far better quality! Next planned outing …. 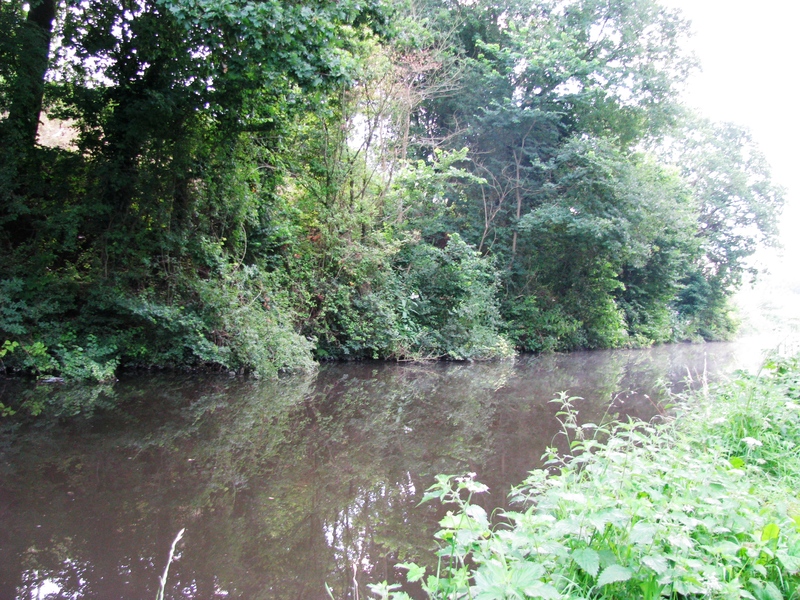 thinking of small river fishing on Sunday 28th July 2013… but depends on weather and other factors. 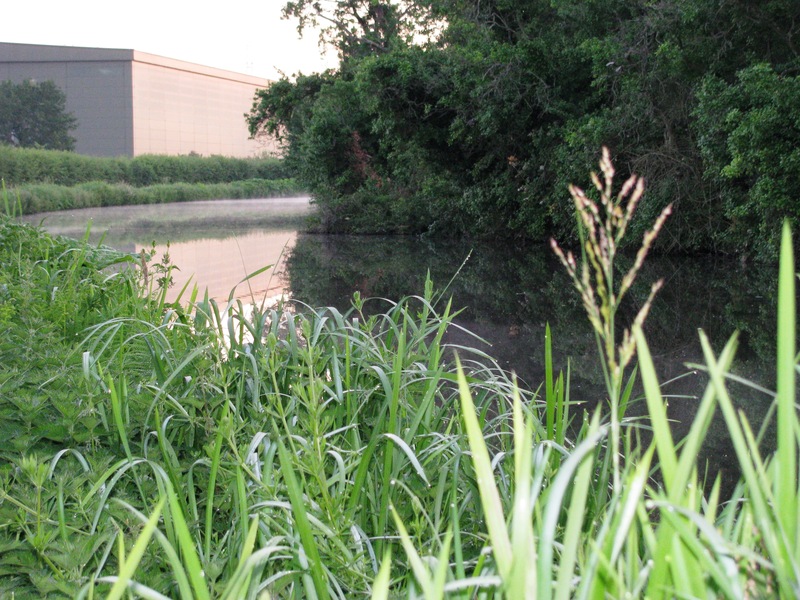 Monday 22nd July 2013 saw Liz and I enroute to the club’s tench (well, tench are the predominant species but also perch, roach, rudd, barbel, crucians, etc) pool at 0700 arriving approximately 0745 and choosing to fish two swims that we’d previously never fished. Weather was warm with hazy sunshine. On arrival I spomb’ed out a few spombs of mixed particles (hemp, maize, wheat) along with some small cubes of luncheon meat and dead maggots on to the edge of the lily pads that separated our two swims. We both fished laying-on style with a 6BB onion float shotted with a 3SSG shot 3″ from the hook and 2 AAA shot just below the overdepth float and baited with maggot (me) and meat, maggot and corn (Liz). By noon we’d not caught a thing although we did have small float nudges and I dropped off three fish of a few inches. Anyway, at this time we made a decision to move on to the adjacent carp pool for the rest of the day to try our luck there. This pool is SUPPOSED to contain only carp and chub as far as I know but although our catches did include chub (1 each of around 6oz) and Liz did lose a good carp when her hook knot failed, the predominant species caught were rudd with a few roach too… and I did also have a tench of around 1lb. I suppose in the 3 hours or so we fished I had around 12/15 roach & rudd, 1 tench and 1 chub and Liz had 3 roach and rudd and lost that carp. Liz did spot a badger wandering down the far bank of the pool too that I missed completely otherwise I’d have had its photo on here!! As it is, no photos from this session at all. 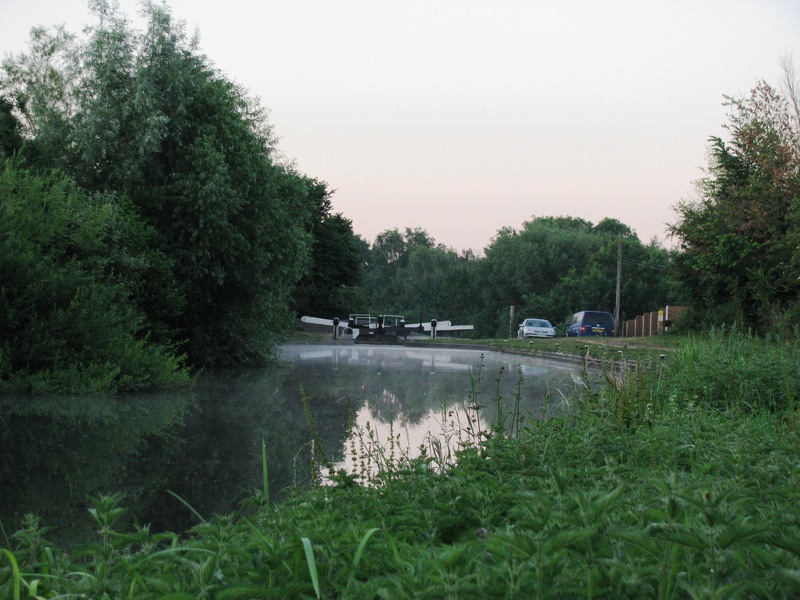 Now looking forward to a session on the canal tomorrow – around 0500 start until 0930/1000 time. 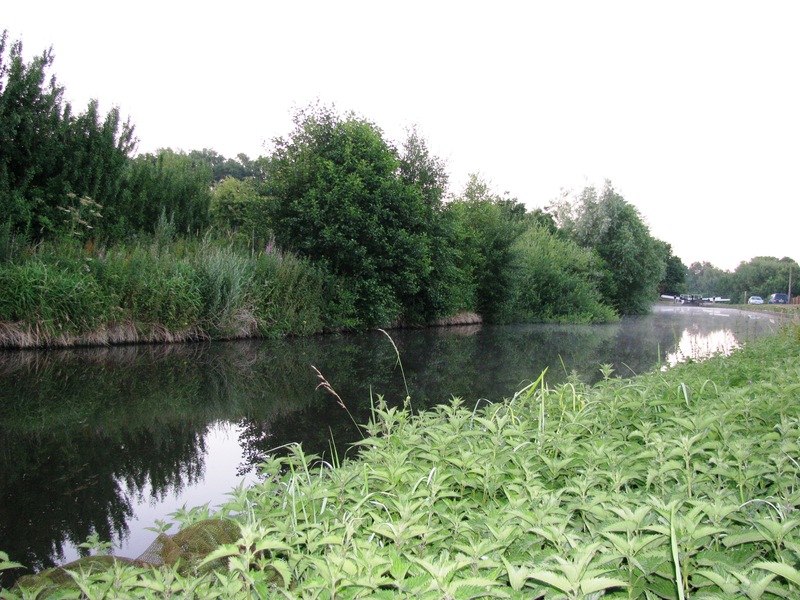 Again I’m heading to a new swim on BAA water – a change from the WDAA canal waters that I’ve been fishing recently- and one that is actually in Des Taylor’s ‘Fishing In The Midlands’ book – a swim with a nice Mr Crabtree type feature there so hoping for the best. 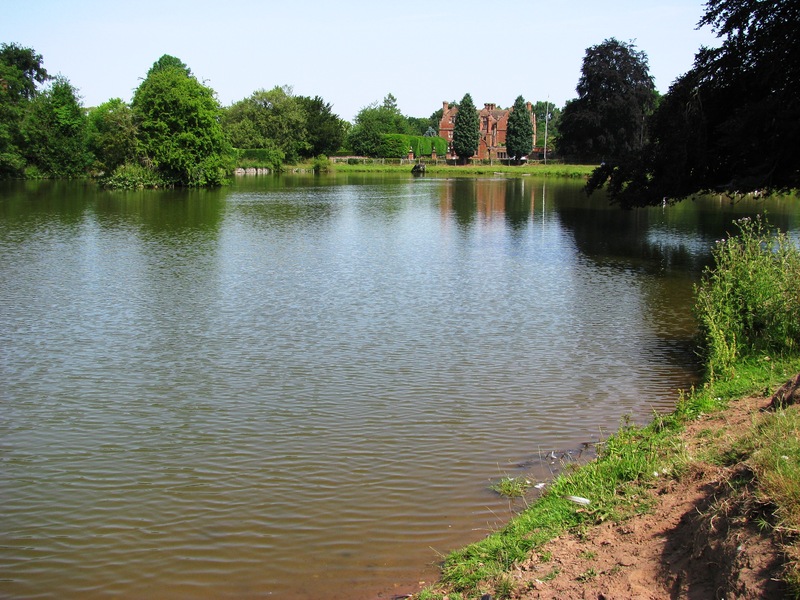 Will be fishing legered/quivertipped maggot and meat with a dunking in various flavoured dips – chopped worm, bloodworm, predator plus and krill being the ones being taken with me. 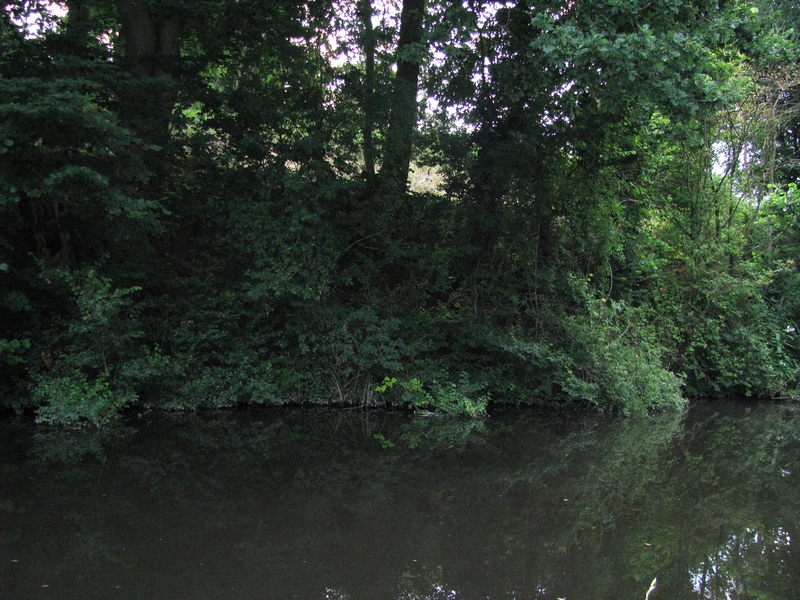 Today, Friday 19th July 2013, was an early morning session on the Staffs-Worcs canal near Wombourne. 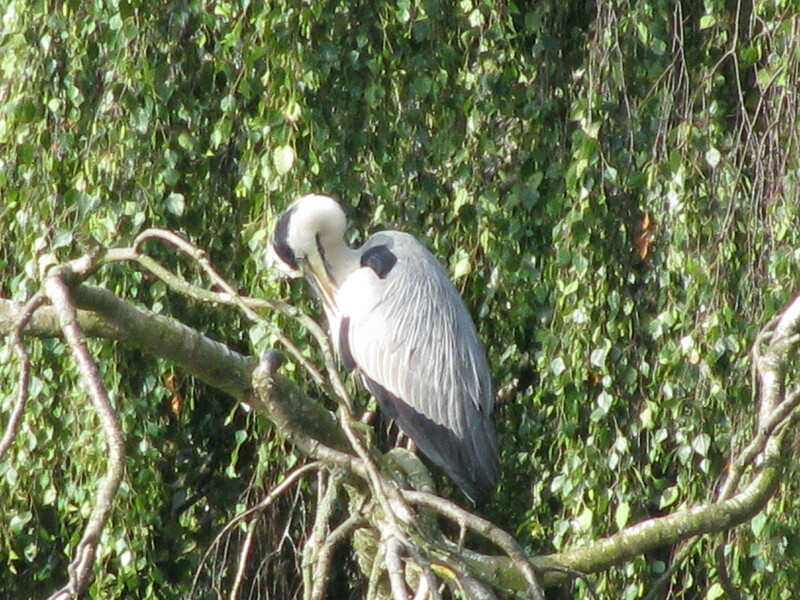 I fished a new stretch today – one I’ve never fished before in my life – as a change from my usual canal destination – but not that far apart really, maybe a mile or so. Weather the usual warm start of the day and bright sunshine as has been the norm for the past few weeks. The latter part of the session was a bit difficult as the sun’s reflection off the water was straight into my eyes – and nothing much I could do about it other than shield with the hand as I needed to watch my quivertip and I was unable to place it in a more sheltered position. 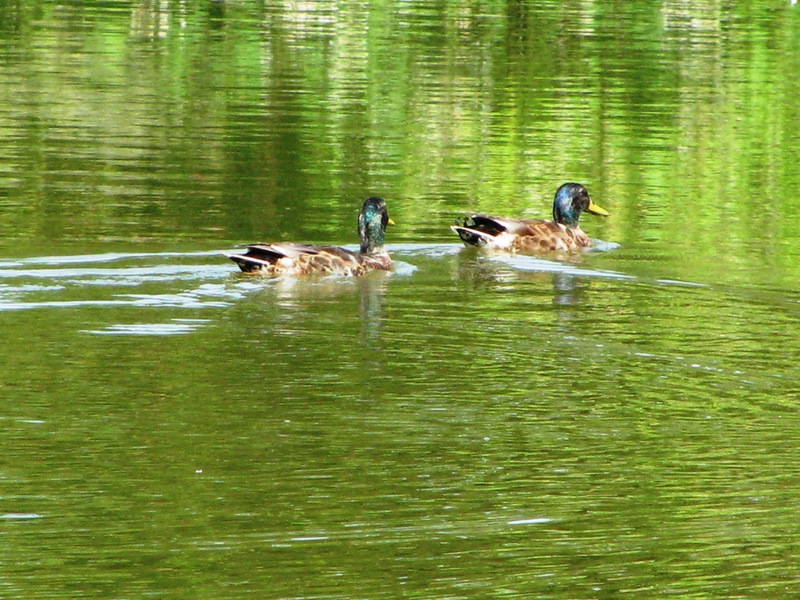 Anyway, arrived on the water around 0515 – later than expected as I got a little lost and went rather round a circular route to get there and wandered along until I located a nice looking swim. Before setting up the usual Des Taylor Avon quiver tip setup I fed around the overhanging vegetation on the far bank a few balls of mixed breadcrumb, chocolate and red silver-fish groundbait laced with dead maggots, and also laid a few down along the near bank too… was nice to see a good bit of growth there for the wildlife to exist in rather than the usual golf-green shorn stuff that the councils are so fond of creating!! After packing up I wandered along the canal for a bit and found a super swim for next week’s canal trip – a great ‘feature’ plus really really sheltered from the sun – it was begging me to stay today but I had to leave as I need to get a few jobs, etc sorted here at home. Tuesday, 16th July 2013, after dropping Liz off at work at around 0700 I headed off for some carp action on one of our club pools (GH) arriving at around probably 0715 and being pleased on arrival that the gate was still locked indicating I was going to get my choice of swim for the day. Weatherwise, the day was a continuation of the very hot, sunny weather we’d had for the past few weeks with temps well into the upper 20’s. So I carried on as planned by spombing out about 1Kg of mixed particles in front of me, off the end of an island directly in front, and then setting up my pod and alarms and my 2 11′ 1.75lb TC rods, both with 8lb Krystonite line straight through to their hooks. One rod was fitted with a sliding 1/2oz bomb on a feeder boom terminated with a size 6 barbless hook, the other a small maggot feeder, again on a feeder boom, terminated with a size 12 barbless hook. Finally, started to pack up at 1815. I did have one further bite on the legered luncheon meat rod at around 1800, which was to the bait cast out after the last capture on that rod at 1105! 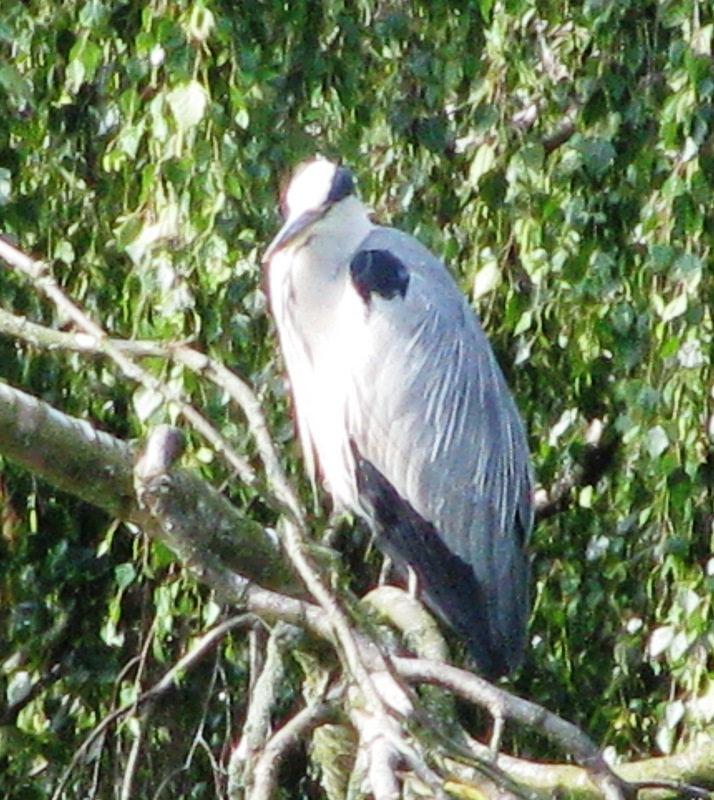 Pics of the day … no ‘fishy’ ones but thanks to the 40x zoom on my ‘new’ (to me – bought off eBay) camera, I did get some reasonable ones of the resident heron on his favourite willow on the island…. 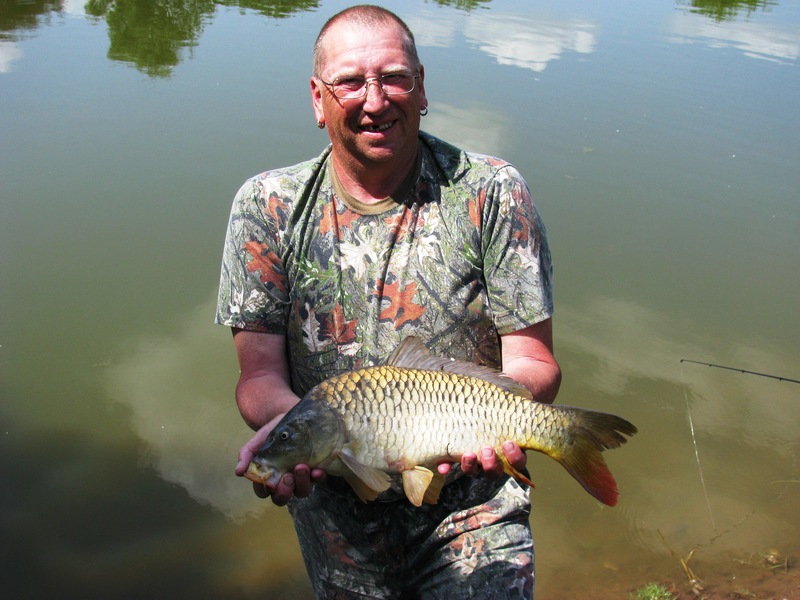 Saturday 13th July 2013, fishing from 0700 to 1830, at a private, normally unfished, pool that the club gets an invitation to fish over 5 weekends of the year with 6 anglers allowed per day session and each contributing £10 to the local church funds. 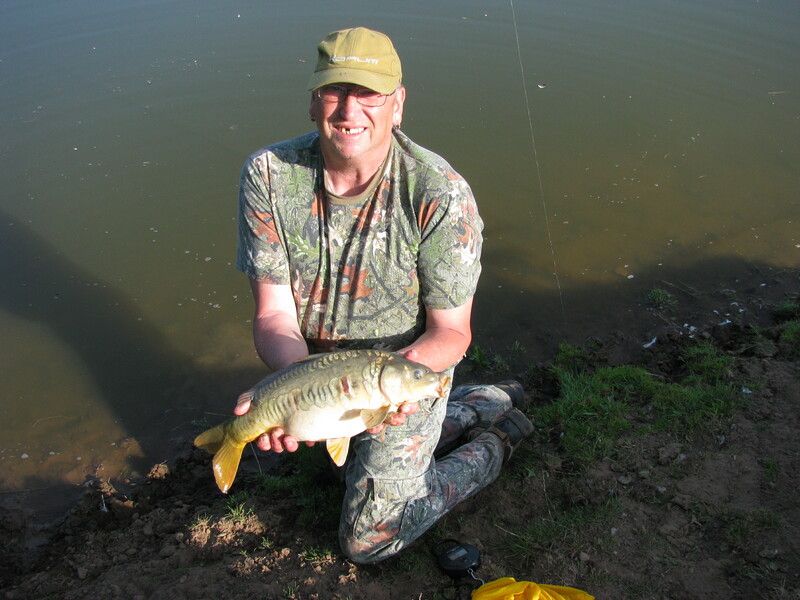 The pool has a good head of tench, carp and perch of good size. Not sure about the bream situation as in 3 years of taking advantage of the invite at this pool neither Liz or myself have caught one – and although we have not caught perch there either we do know of good sized ones being caught by others. Weather of the day was a continuation of the hot (mid- to high 20’s) temps, accompanied by almost clear blue skies that had been the order of the day for a week or more previous to the visit. We arrived at the pool around 0620 in order to get our desired swim by the dam wall and to tackle up and be ready for the 0700 start of fishing. 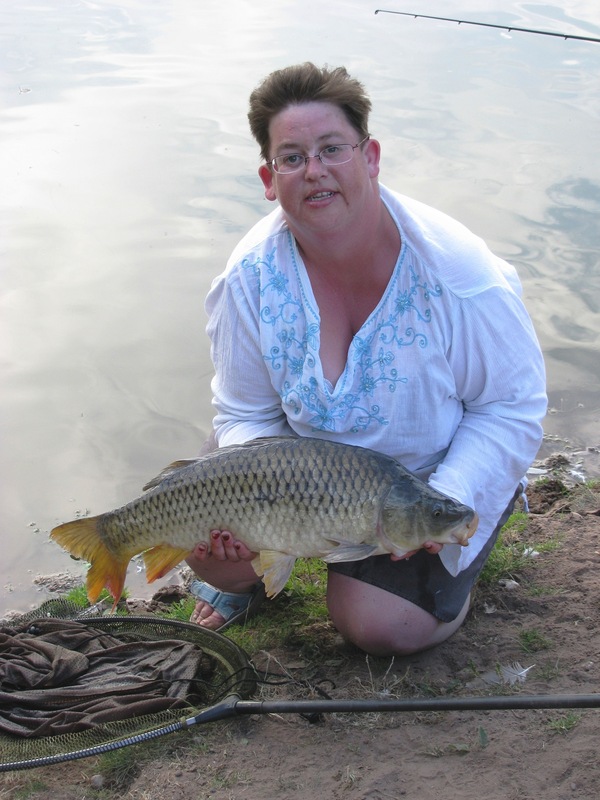 Liz started by laying-on with her float setup, fishing with sweetcorn on her size 16 hook tied directly to 8lb main line whilst I setup a 1.75lb TC leger rod with 1/2oz bomb on a running link 12″ above my size 6 hook and started fishing with luncheon meat cylinders (cut out with an apple corer). I also set up my floating bait rod – 30lb greased braid connected via a cork ball enclosed swivel to 3′ of 10lb monofilament terminated with a size 2 hook. Pre-tackling I also catapulted out a particle mix feed of hemp, maize, and wheat. 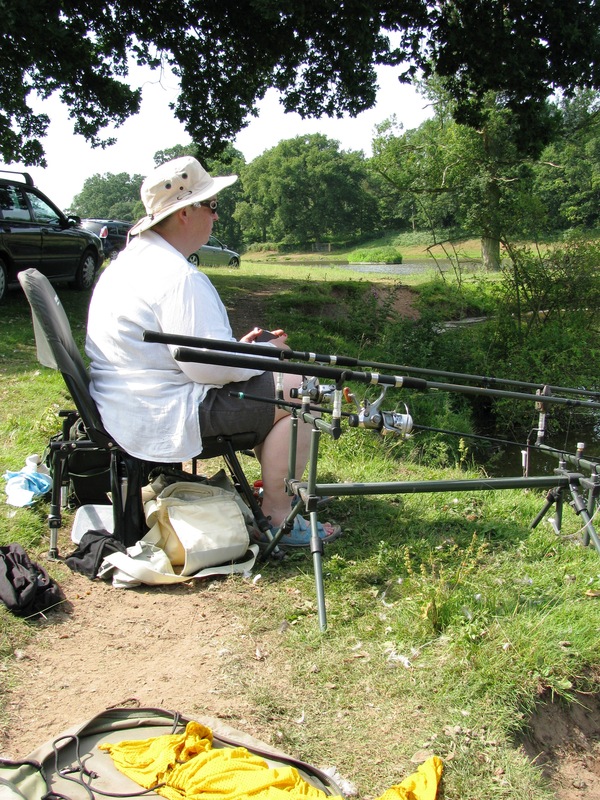 Over the course of the day Liz also set up her 2 1.75lb TC leger rods and at various times fished 1 float and 1 leger or both leger rods together. Myself stuck with my original leger rod, and although I did try floating baits from time to time the floating bait rod lay unused really for 99% of the day. 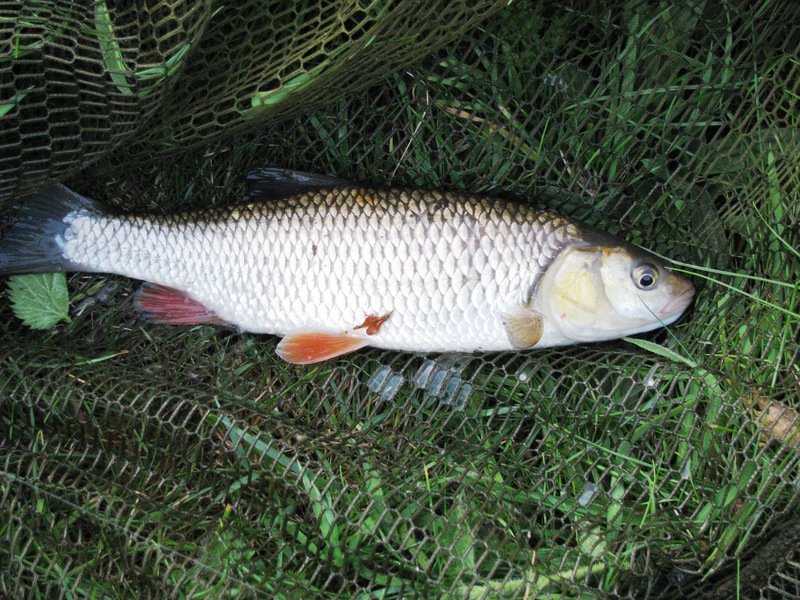 Baits used over the day between us – sweetcorn, maggot, bread (with/without dip), luncheon meat. Anyway, a great day out, and much enjoyed. And Liz has a qualifying entry for a ‘Mission Accomplished’ badge from ‘Improve Your Coarse Fishing’ magazine for her 10lb 4oz carp. 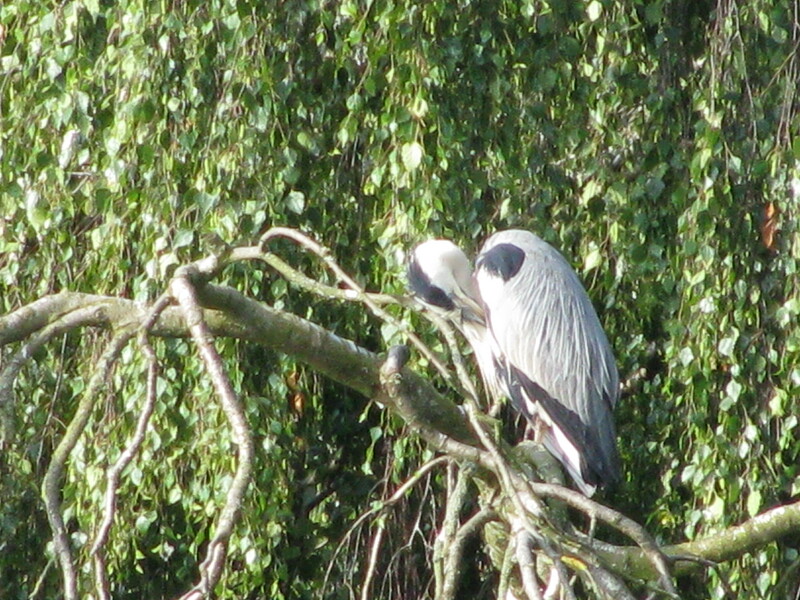 Actually, any of her three carp would qualify as the minimum weight is 5lb but, interestingly, none of mine would! Attentive and ready for action! Fish have pee’d in there, you dirty cow! 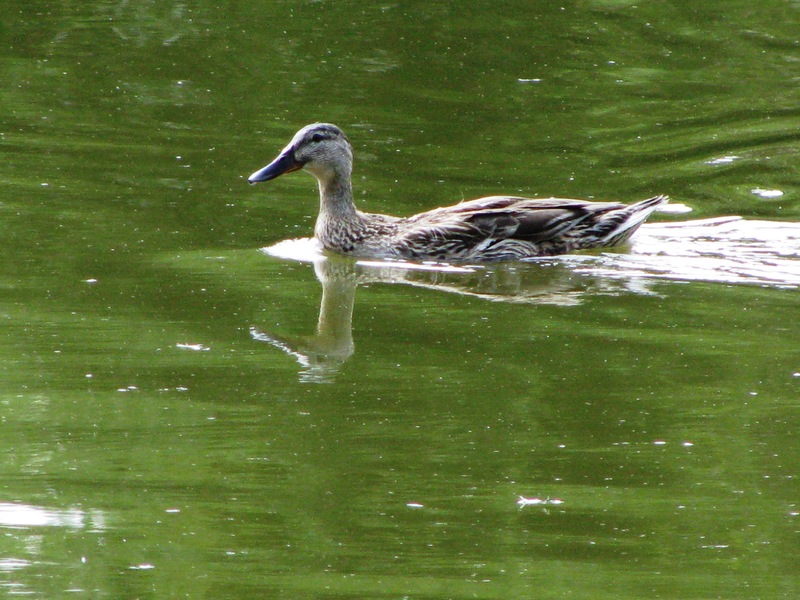 Plans for next week still to be determined but Liz won’t be fishing she says – but will do the following Monday. So I’m a bit undecided – probably go one day to the tench pool, and another day to another of the club pools with possibly an early morning canal session thrown in too… Ummmmmm……. Session 33 – Ready, Action, Cut!!! 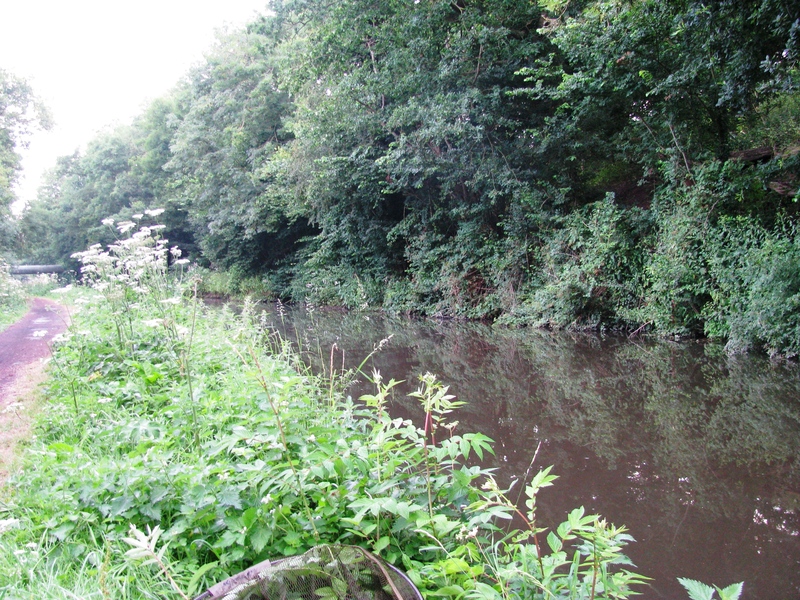 Session 33 was partaken on the morning of July 11th 2013, between 0500 and 0900. on the Staffs/Worcs Canal near Wolverhampton. Setting up to fish in the flow just below a set of locks, the far bank swim was baited with bread crumb heavily laced with dried blood. Tackle for the day consisted of my 10′ Des Taylor Avon System 3 rod set up with the lightest quiver tip, and 6lb line straight through to a size 16 hook with an 1/8oz bomb set 12″ from the hook. Bait was double maggot or maggot/brandling cocktail and baits were dipped in ‘Chopped Worm’ dip. Bites came quickly to start with and in the first half an hour I had 4 small chub (2-3oz), 5 similar sized parch and a gudgeon… followed by further perch to 8oz and chub to 12oz, a few more gudgeon and a solitary and tiny daddy ruffe. I would have fished a little on beyond my actual finishing time for the day but for the fact I’d somehow managed to get a loose line tangle around the reel and the spool and although I managed to sort it out mainly there were a couple of tiny knotted loops left in the line that were impeding casting at times and the length of line containing them needed to be removed but the time to do that would probably have taken me to my allotted time anyway and the boat traffic was starting to build up too. So I decided at that point to pack in and sort the problems out at home ready for the next canal visit, hopefully next week, but intending possibly to try out a new area. 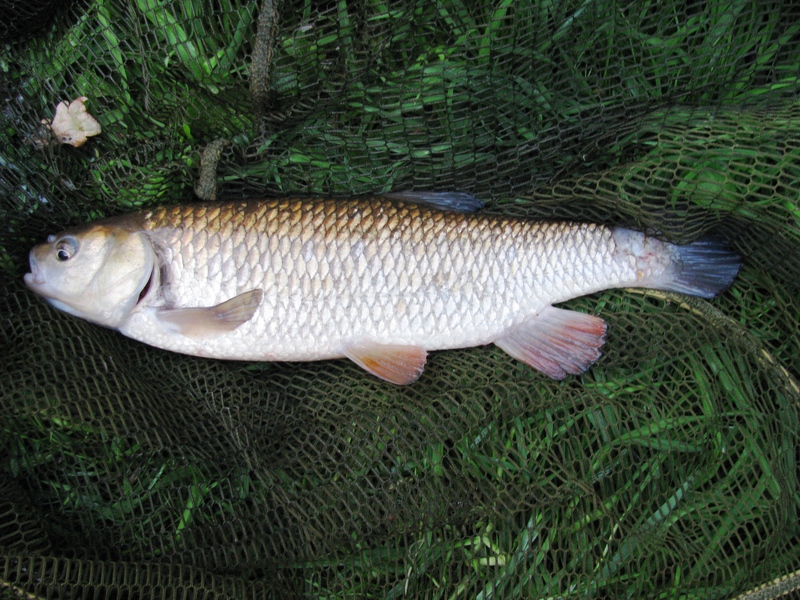 Whilst walking down to my swim, I discovered, on the towpath, a freshly dead chub of about 1.5-2lb, which seemed to be bleeding from the gill area but no other trauma to the body was discernible – probably a victim of the heron that is usually in the area and which was spotted a couple of times during morning. Session 32 – In which Liz and Steve fished in California…. Tuesday 9th July Liz and I took a short trip to California for our fishing session… California, of course, being the name of the pool (there being 11 pools in total there available on day ticket) we fished at the Kingsnordley Fishery near Quatford in Shropshire. It was the first time we’d been to Kingsnordley, and prompted by our obtaining a ‘2 for 1, Sport for All’ voucher from the Sun newspaper. 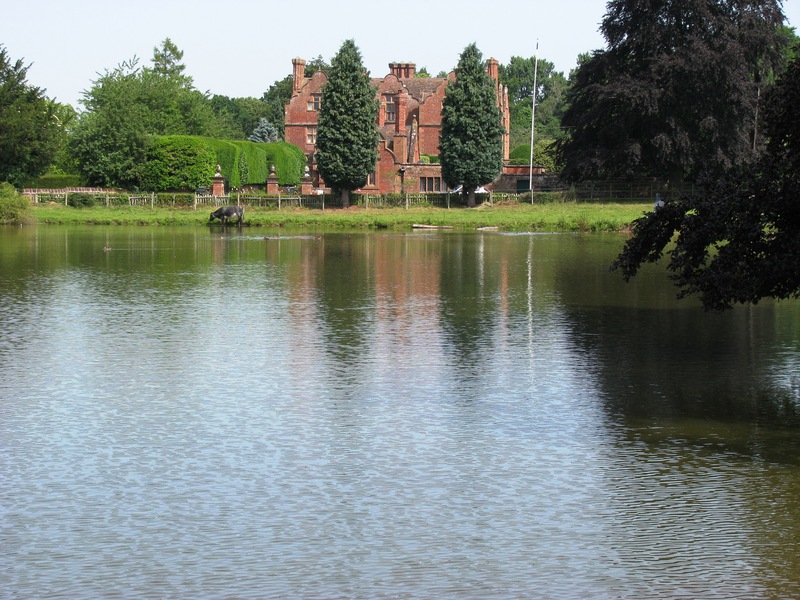 Not that the fishing is expensive there – £5 a day for 10 of the pools and £8 for the other pool, the specimen (‘House’) pool. 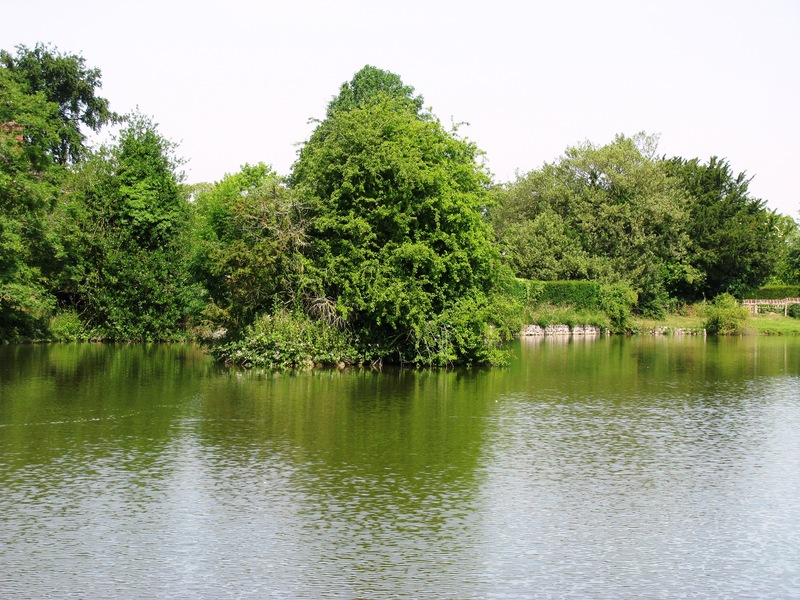 It was a glorious day weatherwise – for us – very hot and sunny – but not the ideal angling conditions for a good days sport albeit that we caught a fair few fish up to 1lb (bream, carp, and perch mainly) with a signal crayfish too for good measure – and had 2 other crays come off. Liz also lost a very good bream when she suffered the hook losing its hold. Plenty of fish cruising – some nice sized carp amongst them – but not really in the mood for feeding although I did tempt one to take a piece of crust but missed on the strike and a guy in the late afternoon had one on the far bank. 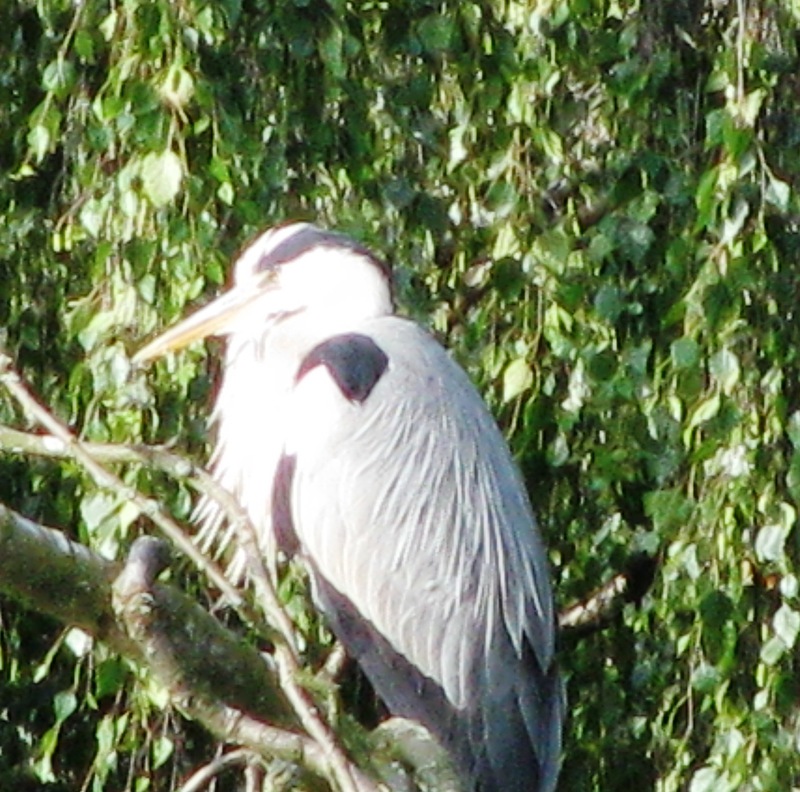 We fished from around 0900 to 1800…. 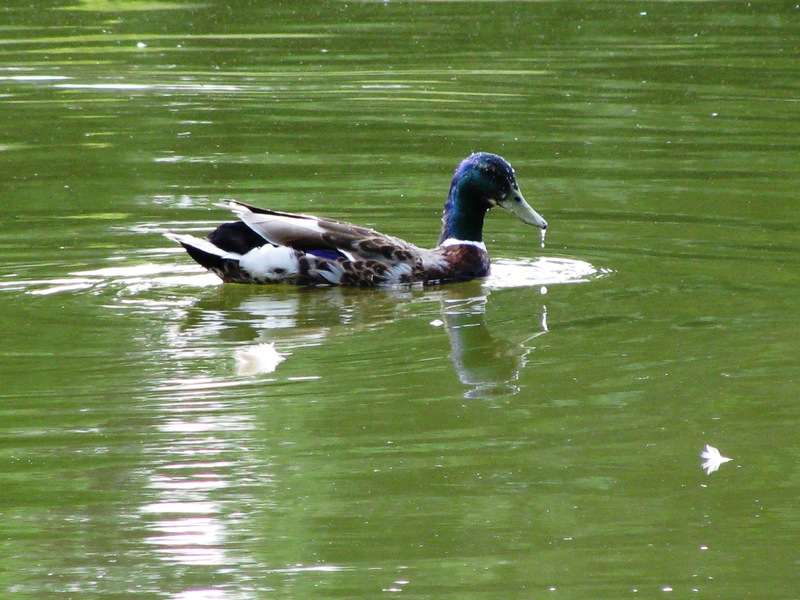 We did walk and look at 8 of the 11 pools before starting to fish – Willow and Kingfisher being a bit distant at the time – and although we thought we’d seen Gage Pool, in fact we were looking at the wrong pool – the one we mistakenly looked at was a private club pool.